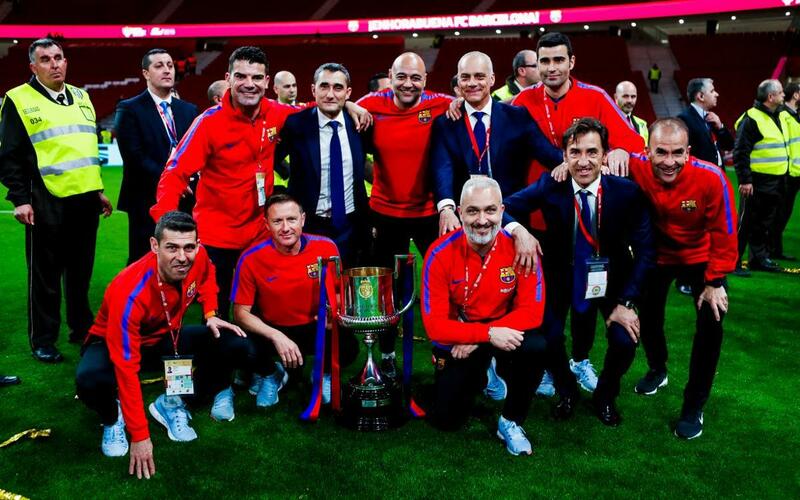 Ernesto Valverde has won his fourth Cup. After the 5-0 victory against Sevilla at the Wanda Metropolitano, he has achieved his first title as a Barça coach, and will now seek to add to it by winning the League title. It’s not the first Cup that the man from Viandar de la Vera has won a Cup, since during his time in Greece, he led Olympiacos to victory in 2009 and 2012. It goes some way to explaining why the whole of Piraeus refer to him as the King of Cups in the Hellenic country. The Txingurri has already won the Copa del Rey with the Club. In 1990, as a 25-year-old player, he was part of the squad trained by Johan Cruyff that overcame Real Madrid 2-0 at Mestalla on April 5, 1990, thanks to goals from Amor and Salinas. In addition to that title, Valverde also won a European Cup Winners Cup with Barça in the 1989/90 season.